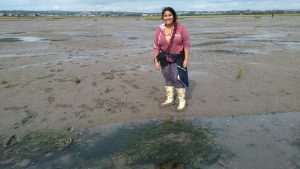 To give you a bit of an introduction, I am a Cardiff University Genetics (BSc) student going into my final year of my degree and have joined Project Seagrass for a Cardiff University Research Opportunities Programme (CUROP) summer research placement, at their offices in the Sustainable Places Research Institute. I stumbled upon Project Seagrass rather unexpectedly and had no idea what it was all about. Upon reading further into what seagrass is and the work Project Seagrass does, I was very keen on joining the team to learn more and take part. The Project Seagrass team are the nicest people I have worked with and maintain a lovely work environment where research and collaboration can flourish. When I first heard of the organisation, I did not know what seagrass was nor how important it is. Seagrasses are flowering plants that live in marine environments off the coast in shallow water. I know many people, including myself before this project, do not know the difference between seaweed and seagrass. Seagrass has roots, stems, leaves and flowers just like terrestrial plants do and holds some very important roles. I have learnt that seagrass is vital for: food security for coastal communities; fisheries; increasing water quality, reducing atmospheric carbon dioxide and as a food source for plant eaters like sea turtles! That is a long list of important roles which I had no clue about. This made me realise how seagrass is absent from public awareness. Rainforests get lots of publicity, yet seagrass, that can sequester carbon ~35 times more efficiently, somehow lacks it. Hopefully, in time that will change as more people realise that public awareness needs to be raised. Unfortunately due to several factors, seagrass is declining (if you want to learn about why, go to the Why Seagrass). This is catastrophic given the amount seagrass does for the marine environment as well as for us. Project Seagrass aims to push conversation efforts, educate the public and collect data on seagrass to the goal of restoring seagrass meadows to their former health and abundance. I am from a rather specialised degree, however, I found I quickly adapted to research here and am greatly enjoying it. Project Seagrass runs multidisciplinary projects which is why the collaborations are so exciting and surprising! My work itself is has been a mixed bag of literature reviews, data analysis, application development and learning lots about seagrass and citizen science. Seagrass is not sufficiently mapped due to the dynamic and vast nature of seagrass; it shrinks and grows with changing seasons and conditions. Plus, it is spread globally and is under water so it is often hard for scientists to fully monitor. This is where the use of citizen science could be a game changer. Citizen science is the participation of citizens in the collection of (usually ecological) data in collaboration with scientists. Citizen science is fantastic as it has the potential to increase data points by thousands compared to scientists collecting data alone, and it means more area is covered too. This Earth is shared by all of us so if people are passionate about conservation and want to help, citizen science is ideal. It gives individuals the chance to make a meaningful contribution to scientific knowledge as well as protect what they care about. In line with using citizen science to save seagrass, Project Seagrass has created a mobile application called SeagrassSpotter which is available on iOS and Android. SeagrassSpotter data is used to map seagrass. This is done as users report sightings of seagrass, whether it be while going kayaking or walking their dog on the beach. The report is logged in the form of a geographically tagged photo of the seagrass and is put publically on the SeagrassSpotter database so everyone can view it. Mapping seagrass is important so Project Seagrass has data that enables them to reinforce conservation action, petition for needed conservation policies, as well as make targeted actions in specific areas where more research is needed. This data would also help identify areas where seagrass has been declining and where it is still flourishing. My project concentrates on analysis of the demographics of current SeagrassSpotter users, which has never been investigated before. The demographics of users are of particular importance as we want to ensure that SeagrassSpotter is used by citizens of all ages and professions, not solely by researchers. If it turns out, participants are mainly researchers, then we need to think about how best to make SeagrassSpotter accessible and known to the wider public. If the results show that there are mainly young users, we need to find ways to make SeagrassSpotter more user friendly for the older generations. After analysing the results, I will generate applicable suggestions and improvements on how to increase citizen participation as well as ideas for technical application improvements. The demographic data is being obtained by means of a survey which was made in collaboration with, master’s student, Oliver Dalby. The survey has citizen participation motivation questions as the main portion which is what Oliver’s project focusses on. The demographic questions at the end of the survey is how the data I am analysing for my project is collected. I hope that my work will contribute to making SeagrassSpotter more widely used as well as add to the understanding the user-base of the application and what effect that has on data collection. This in turn would ideally lead to more users of the application, resulting in more data and more mapping of seagrass. The objective is to use this information to push for change to protect seagrass, subsequently saving wildlife and protecting communities. My time working on this project has opened my eyes to the importance of seagrass and its conservation. I have also learned new transferable skills as well as gained specific knowledge of citizen science. I can see the need for geneticists in seagrass research so who knows what could come of the future. I am happy to be here now and to be contributing to furthering Project Seagrass’ cause. I am thankful to Leanne for accepting me on and guiding me on this project and to Oliver for collaborating with me. I am having an absolutely splendid time learning and taking part. I implore anyone interested in this project to get in touch and participate, it really is worthwhile. If participation is not an option for you, please help raise awareness and share what you know with those around you. The more people know about this, the more can be done and the greater the impact. I hope you have enjoyed reading my blog post, thank you for taking the time to read it.